HOMER — More tourists are projected to arrive in Alaska by sea in 2019. A lot more. Cruise ship tourism is estimated to increase by about 16 percent in 2019 over 2018 numbers, according to projections from the Cruise Lines International Association. 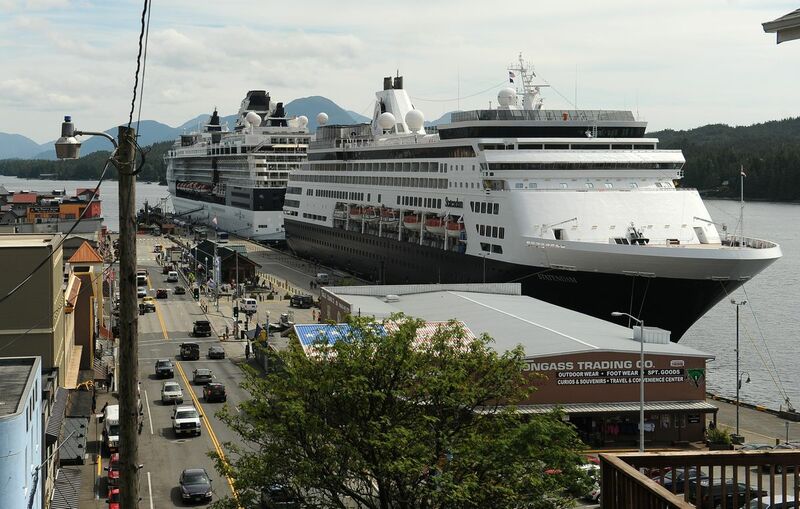 In raw numbers, that translates to about 1.3 million tourists arriving by cruise ship to destinations including Juneau, Sitka, Skagway, Seward and Valdez, among other ports. A 16 percent increase in passenger numbers translates to about 175,000 people more than last year. The industry is adding more port calls and more passengers per port call. Not only are there are more ships coming to Alaska, the ships are getting larger. Three new ships — the Norwegian Joy, Royal Princess and Ovation of the Seas, all of which carry more than 3,000 passengers each — join the Norwegian Bliss, which carries more than 4,000 passengers, in Alaska waters, according to a news release from the CLIA. “With one exception, next year’s ships are either new to the trade or larger than the ships they replace,” the news release states. Though tourism in Alaska has generally been increasing for the past several years, the cruise ship industry has particularly been growing, said Sarah Leonard, the president and CEO of the Alaska Travel Industry Association. Though scheduled cruises take passengers everywhere from Nome to Ketchikan, the vast majority of the cruise ships will dock in Southeast. Juneau is expecting nearly all 1.3 million of those passengers, with at least one cruise ship docked there nearly every day from the end of April through the beginning of October. Juneau has been building out its dock infrastructure for cruise ships over the past several years, with two owned by the City and Borough of Juneau and two privately owned. The port can take another ship through a lightering system, and on heavy days can rotate ships through the docks on a “hot berthing” system, said Carl Uchytil, the port administrator for the City and Borough of Juneau. The trend is definitely toward larger ships in the cruise industry, and the city is trying to accommodate that with its infrastructure, he said. Over the past decade, cruise ship tourism has increased by about 50 percent in Juneau. On a heavy ship day, the city can host about 15,000 visitors in a town of 32,000, Uchytil said. As the ships get larger and accommodate more passengers, that may increase to 20,000 on a heavy day, he said. When the passengers disembark, they’re frequently headed out for excursions, and the city has tried to plan around that flow of travel. For its part, the cruise line industry has also tried to work with the community to mitigate impacts. Two decades ago, city and cruise line representatives began developing a program to implement “best practices” for tourism businesses operating in Juneau and Alaska at large. Kirby Day, the manager of port operations for Holland America in Juneau, said it’s largely been successful, even as tourism numbers continue to grow. Some of those ways include making restaurant deliveries earlier, scheduling flightseeing tours to avoid flying too much over homes, considering impacts of hiking traffic on trails, reducing off-ship announcements in-port and scheduling bus traffic, among other things. In the 1990s, when the cruise ship industry was growing rapidly in Alaska, the communities didn’t have programs to account for the impacts; with the program in place, Day said he thinks the communities are better positioned to absorb the impact of increased tourism numbers. Cruise ship passengers who arrive in port eat at restaurants, buy souvenirs and go on guided trips, which contribute to the regional economies. Tourism businesses to serve them have multiplied in Juneau in the past two decades, Day said. Elizabeth Earl can be reached at elizabethearl@gmail.com. Elizabeth Earl is a freelance reporter based on the Kenai Peninsula. Reach her at elizabethearl@gmail.com.